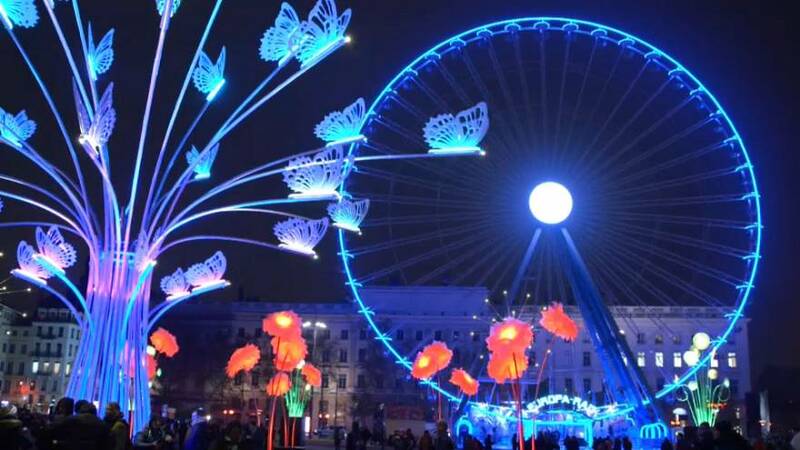 The city of Lyon, France will be lit up by spectacular light shows from December 7 for the annual Fete des Lumieres ( Festival of Lights). Around one million visitors a day are expected to descend upon the city centre for this unique event. Over four nights around 50 installations by a variety of different artists will light up buildings, streets, squares and parks all over the city. "This year we are particularly happy because this is a completely new programme. Last year, in 2016, we used the programme that we unfortunately couldn’t use in 2015," said Jean-Francois Zurawik, events director for the City of Lyon. "And here, for example, what we are going to see, ‘Spider Circus’, it’s close to our hearts but there are others." "I think Helen Eastwood and Laurent Brun’s work on the cathedral has a real lightness to it that’s interesting." "I also really love the grand garden in Bellecour Square with the great gardener, Louis XIV." "We began with the notion that on the cathedral’s façade that you see here, each stone is different in its size, form, its weight," says Helen Eastwood Co-Artist / Creator of Unisson. "And at the same time each one of them is indispensable to the formation, to the cohesion, to the ensemble." "If we take away one stone, everything crumbles." "So we wanted to play with this idea that from lots of little pieces and lots of little individualities, if we manage to move all together, to unite, we can create new paintings, decors and new things." The Festival begins on December 7 at 7:30 p.m by the chiming of the bells of the City Hall on Place des Terreaux. The City of Lyon’s official bell ringer and ringing master, Charles Dairay, will perform a 15-minute concert featuring extracts of film music inspired by the soundtrack of “Enoha fait son cinema”. On December 8 at 12:30 p.m. the bells will chime to welcome in the winter months and launch the countdown to Christmas. The Fete des Lumieres is part of the traditional festival on the 8th December, when the residents of Lyon celebrate the Virgin Mary, whose statue stands on the Fourvière hill, overlooking the city. On the 8 September 1852, as the city was preparing to celebrate the installation the statue, the River Saône overflowed and the ceremony had to be abandoned. The festivities were put back to December 8 that year. But when a violent storm broke out during the day, the event had to be abandoned again. But the weather improved as night fell and people in the city spontaneously lit their homes with candles and Bengal lights and came down to the streets. Since then the ritual has been repeated every year - with windows and balconies decorated with thousands of little lights. Since then the festival has become one of the world’s major event for creative light displays, showcasing the work of top artists and offering an open-air laboratory for up-and-coming talent.